The Boston Pride have not had a shortage of talent by any means this season. As the only undefeated team currently in the league (8-0), the offensive prowess of players like Briana Decker and Alex Carpenter cannot be understated. However, other players’ contributions have also been critical to the team’s success, including those of defenseman Blake Bolden, whose impact on and off the ice have proven to be equally important throughout her professional career. Growing up in Cleveland, OH, Bolden’s love for hockey blossomed at the ripe age of six, when she began following the IHL’s Cleveland Lumberjacks thanks largely to her father. Her father worked for the team at the time and would often bring her into the locker room and introduce her to many of the players. Little did Bolden know at that time that her burgeoning passion for hockey would ultimately lead to an illustrious professional playing career. By high school, Bolden had enrolled in the Northwood School, which boasts a reputation as one of the top high school hockey programs in the country. 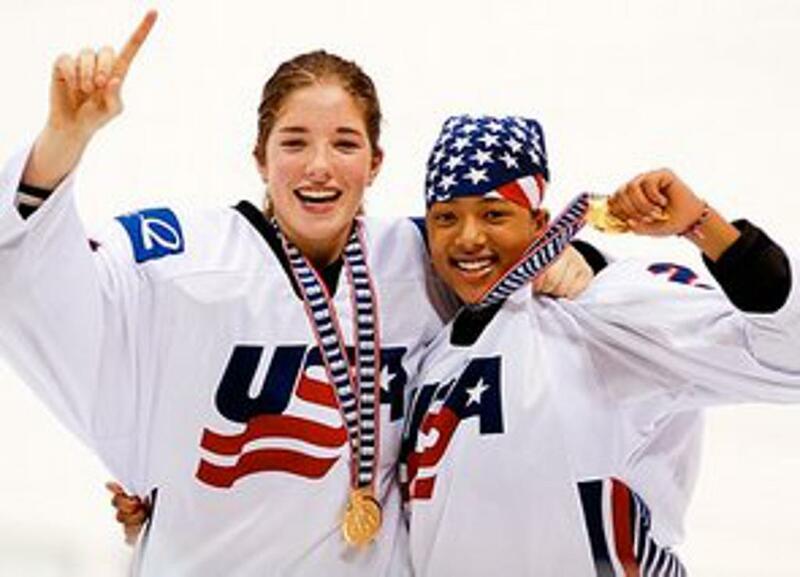 Bolden served as team captain here during her senior year, and was also selected to play U-18 National Team in 2008 and 2009, winning gold in both tournaments. By the end of her high school career, Bolden had established herself as a force to be reckoned with on the blue line and earned the privilege to dawn an Eagles jersey for the next four years at Boston College. Bolden led all Hockey East freshmen defenders in scoring with four goals and nine assists for 13 points and was named a team captain in her senior season at Boston college, Bolden was selected in the first round, fifth overall by the Boston Blades in the 2013 CWHL Draft. Bolden with NWHL All-Star Captain Kelley Steadman in 2008. This would mark the first time that an African-American player was drafted in the first round in the CWHL Draft's history. To no one’s surprise, Bolden continued to shine during her rookie season with the Blades, accumulating 19 points in 23 games in the regular season. In 2014, she was selected for the 1st Canadian Women's Hockey League All-Star Game and led her team to capture the Clarkson Cup in 2015. When Bolden was drafted by the Boston Pride the following year to play in the NWHL’s inaugural season, her successes invariably followed her. Bolden’s one goal and nine points through 18 games last ranked third among all team defenders and was an instrumental piece to the Pride’s overall depth that helped to catapult them to prevail in the first-ever Isobel Cup Championship. After resigning with the Pride for a second season, Bolden has served as a key ingredient to the Pride’s success this season through her dynamic defensive play while also make significant contributions offensively, amassing five points (1g,4a) and a +12 rating in 8 games. She also is currently tied for the team lead in blocked shots (7). As a black girl, you can only imagine the looks I would get. It made me push harder and really fueled my desire to be the best ‘Blake Bolden’ I could be. Hayley Moore, the General Manager of the Boston Pride, once dubbed Bolden an “excellent ambassador for our sport.” Indeed, Bolden serves an inspiration for both current and future hockey players, as well as other members of the community, through the dedication, leadership, and overall kindness she has displayed throughout her career. While her Pride team push forward to make a return to the Isobel Cup Finals, she can rest assured that somewhere, a young girl watches on from the bleachers (or perhaps through a live stream), wondering if she too can achieve her dream of playing in a women’s professional hockey league one day.